5th February 2013 Ascot, UK – ZBD, the leading provider of fully graphic epaper display systems for retailers and commercial users globally, has announced that the Faculty of Science of the University of Amsterdam (UvA) is using ZBD’s epaper displays to improve the efficiency of its room booking process. The project has been undertaken by ZBD's local partner in the Netherlands, system integrator, CREO-CPS. 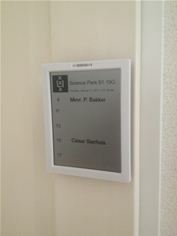 The UvA has implemented ZBD’s system to replace paper signs showing booking information outside 28 meeting rooms. As a result, students and staff can see at a glance when rooms are booked, how long for and who is using them. Rooms can be booked online and each display is updated automatically when changes are made. The fully graphic screens are able to display a complete daily timetable for each room so that students can quickly and easily see if and when a room is free. Information displayed on screen includes the time, duration of booking, the name of the student who has reserved the room, or the course that will take place. ZBD’s system is very ‘light-touch’, making it quick and easy to install. Displays are updated wirelessly from a central point so require no manual intervention. The system is also maintenance-free, enabling university staff to avoid spending time printing out paper signs on a daily basis. Gerrit Oomens, ICT Manager at the Faculty of Science, said: “ZBD’s epaper system has allowed us to expand the use of our meeting rooms and enable students to book rooms online for different times of the day. Printing these lists, which would change throughout the day, was highly inconvenient and we have now eliminated the need for paper signage relating to 28 different rooms within the university. ZBD is the leading provider of fully graphic epaper display systems for retailers and industrial users globally. The company has developed the next generation of LCD, creating high-contrast bistability that requires no battery power to retain its image. The University of Amsterdam (UvA) has its origins in the Athenaeum Illustre, which was originally founded in 1632. Today, UvA has more than 32,000 students, over 5,000 employees and an annual budget of 600 million euros, making it one of the largest general research universities in Europe. Teaching and research at the UvA are conducted at seven faculties: Humanities, Social and Behavioural Sciences, Economics and Business, Law, Science, Medicine and Dentistry. The UvA has risen to international prominence as a research university and is placed highly in rankings of universities across the world.